Is Target Corp. (NYSE: TGT) Stock a Buy? Subject: Is Target Corp. (NYSE: TGT) Stock a Buy? 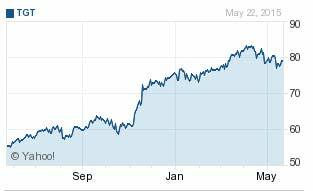 TGT stock is up 42% in the past year, and a modest 4% in 2015. Target's Q1 2015 earnings, reported May 20, handily beat estimates. Earnings per share (EPS) came in at $1.10. Analysts were expecting EPS of $1.02. Revenue rose 2.8% to $17.1 billion. Comparable store sales, which measures established locations, matched projections rising 2.3%. Online sales, meanwhile, surged 40%. Looking ahead to Q2, TGT anticipates EPS of $1.04 to $1.14. That's within the range of $1.12 analysts had forecast. The Minneapolis, Minn.-headquartered company also resumed stock buybacks in Q1 – something it hasn't done since 2013. The company repurchased $562 million in shares during the quarter. Further, Target raised its full-year earnings forecast to $4.50 to $4.65 a share. Previous guidance was $4.45 to $4.65. Chief Executive Officer Brian Cornell is credited with getting Target back on track. A former PepsiCo Inc. (NYSE: PEP) executive, Cornell took the top spot at Target last August. Cornell wasted little time shuttering the chain's money-losing Canadian operations upon realizing the subsidiary wouldn't be profitable until 2021. In January, Target began closing its 133 Canadian stores. Money Morning Global Resource Specialist Peter Krauth said closing Canada was the right call. "Despite the fact that things didn't turn out too well in Canada, I think that management was eventually, at least, willing to take their lumps and see where the mistakes were," Krauth said last month. "I think that speaks well to upper management." The move allows Cornell to focus on revitalizing Target's core U.S. operations.